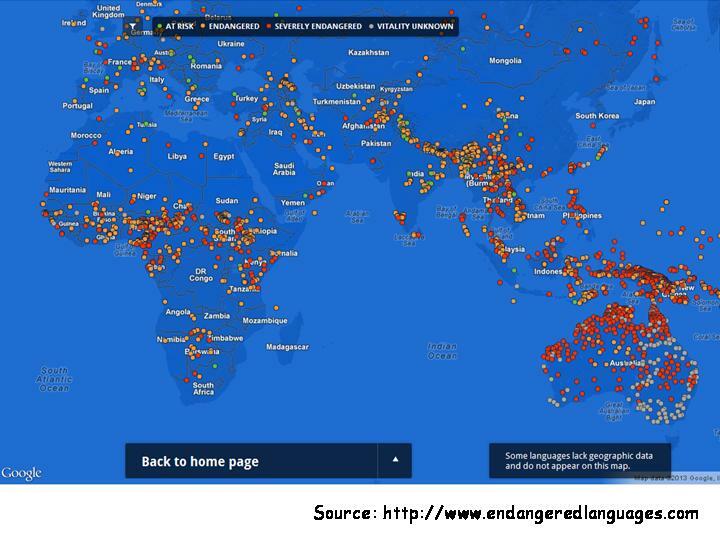 A striking map depicting endangered languages around the world can be found at the website of the Endangered Languages Project (ELP), the public portal of the Endangered Languages Catalogue (ELCat) helping raise awareness of and gathering data on endangered languages. This data has been compiled by linguistic research teams at the University of Hawai’i at Manoa and Eastern Michigan University in a project supported by a National Science Foundation grant. The catalogue contains comprehensive up-to-date information on all languages considered to be in danger, including the number of speakers, the age of the youngest speakers and the location of each language; the genetic affiliation to a linguistic family for every language; and an account of the documentation and data for all languages in the database. The ELP is an initiative of the newly formed Alliance for Linguistic Diversity, a coalition of international linguistic and cultural organizations, and Google. The Rosetta Project and PanLex Project at The Long Now Foundation are also members of the Alliance. But anyone involved with endangered languages is invited to contribute to the database. The findings shed new light on the issue of language loss. Earlier estimates predicted the death of 50-90% of the world’s languages by the end of the century; some claimed as well that one language goes extinct every two weeks. The prediction of a 90% languages loss by the end of the 21st century stems from a 1992 paper by Michael Krauss, professor emeritus of the University of Alaska Fairbanks and expert on the indigenous Alaskan language Eyak, whose last native speaker passed away in 2008. Krauss arrived at this estimate based on the best available sources at that time. Over two decades later, ELCat’s much more comprehensive database suggests that Krauss’ figure was too high. 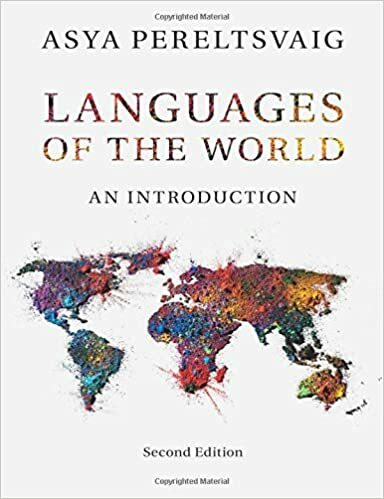 Krauss may be correct for North America, Australia, and New Zealand, but on the global scale, as a total of only 3,176 languages (46% of all living languages) can considered endangered. Krauss’ lower estimate of 50%, however, seems on-target if endangered languages keep losing ground. The common estimation that a language dies out every 2 weeks must also be revised based on the new data. 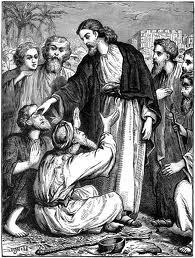 This figure has been repeated so often in it is hard to trace back to the source. ELCat’s new findings suggest that language death progresses at the rate of about one language in three months (Campbell et al. 2013). This estimate is based on the number of languages that we know have become extinct in the recent past rather than on estimates of how many languages might go extinct in the future. The new findings also show that the rate at which languages die out has highly accelerated in the last half century. 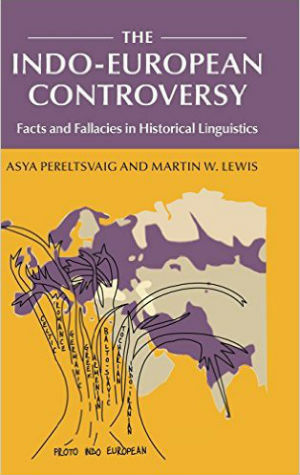 What is worse, the findings point out that since 1960 we have lost as much as 28 entire language families, which is even more devastating from the viewpoint of linguistic diversity. To compare this to biodiversity, extinction of a language may be paralleled to the extinction of an animal species, but the death of a whole language family would then equal the loss of a whole branch of the animal kingdom, for example all felines. Hundreds of language families that have gone extinct over the course of history, but the fact that 28 of them have died out over the relatively short time span of the last 50 years is symptomatic of the accelerated rate of language loss we are experiencing in recent times. Krauss, Michael E. 1992. The World’s Languages in Crisis. Language 68(1): 4-10. Campbell, Lyle; Lee, Nala Huiying; Okura, Eve; Simpson, Sean; Ueki, Kaori. 2013. New Knowledge: Findings from the Catalogue of Endangered Languages (“ELCat”). 3rd International Conference on Language Documentation & Conservation.